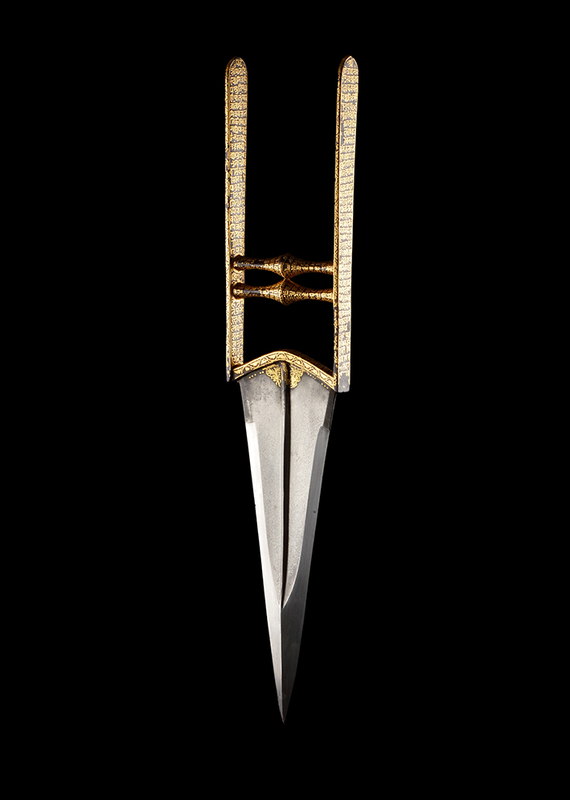 This katar has sacred Hindu verses decorating its hilt, all applied generously in gold on a cross-hatched, blackened surface. The calligraphy is neatly arranged, wrapping expertly around the handgrips and rendered in short, regular lines on the side-bars. This text is a Sanskrit stotra known as the Rāma-rakṣā-stotra, attributed to Budhakauśika Ṛṣi. It is a hymn of praise and used as a prayer asking for protection from Lord Rama. Like many stotra, it has a distinctly tantric character, its recitation often meant to be coupled with breathing practices, visualisations and the wearing of talismans—making it ideal for its application on this dagger, which would have been an important object of devotion. The short blade is made of Indian crystalline wootz Damascus, with a pronounced central rib and a swollen, armour-piercing tip. The original wooden scabbard still retains its red silk velvet covering, though it has now been worn and faded by its considerable age. The silver chape is also original. A similarly decorated hilt is illustrated for us by Hendley and shown as being inscribed with Shakti stotra—or lines in praise of the Devi. Indian arms decorated with such lengthy religious verses are scarce and highly sought-after and we are privileged to be able to offer another in this catalogue, this time a tulwar: item number 11. T. H. Hendley, Damascening on Steel or Iron as Practised in India, W. Griggs & Sons Ltd, 1892, pl.16.